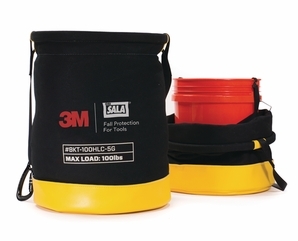 The 5 Gallon Safe Bucket has been designed to safely transport standard 5 gallon plastic buckets at height. This bucket is larger than the standard Safe Bucket. A patent pending hook and loop closure system allows the bucket to be locked closed during transport of the bucket. 5 Gallon plastic bucket is not included. Safely transport a 5 gallon plastic bucket by placing it inside the 5 Gallon Safe Bucket.